Jim Riggleman is 40-38 since becoming the Cincinnati Reds’ interim manager in April. Joey Votto, Eugenio Suarez and Scooter Gennett arrived at the All-Star Game in style Tuesday. Votto sported a Panama hat straight out of the 1920s. Suarez and Gennett walked the red carpet before the game in Washington, D.C., with their wives, and Suarez carried his young daughter. The Cincinnati Reds all-stars translated that sense of style into productive performances in the final innings of the Midsummer Classic at Nationals Park. Gennett hit a game-tying, two-run home run in the ninth. Votto added a solo home run in the 10th — his first hit in six All-Star Game appearances — to give the National League brief hope in a 8-6 loss. Much as they were in the All-Star Game, the Reds should be fun to watch after the break even if the season ends up being a loss in the end. 1. 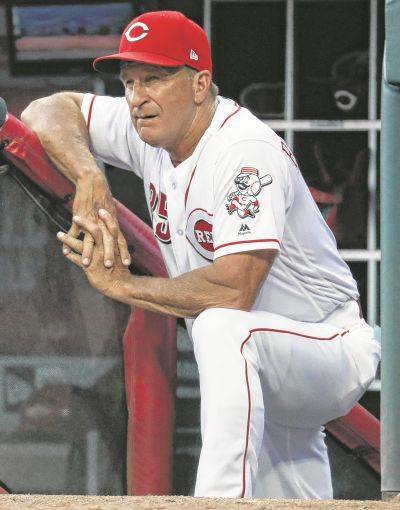 Manager search: Interim manager Jim Riggleman has done his best to make the front office consider him. He’s 40-38 since replacing Bryan Price, who was fired in April after a 3-15 start. At 43-53, the Reds are on pace win 72 games. That would be a four-win improvement over the last two seasons when they finished 68-94. However, the Reds are 21-10 since June 10. If they keep up that winning percentage (.674) for the last 66 games, they would finish 87-75. It might be hard to not pick Riggleman if that’s their final record. Votto praised Riggleman on Monday, saying he has stayed on top of the players and expects them to play a certain way. 2. Potential deals: The non-waiver trade deadline is July 31. Matt Harvey, who is 5-3 with a 3.64 ERA in 12 starts since the Reds acquired him from the New York Mets, has pitched well enough to interest contending teams. The Reds also will have to decide what to do with Scooter Gennett, who told MLB.com earlier this month the Reds want him here for the long term. 3. Pitching staff: Homer Bailey pitched seven shutout innings Wednesday for Triple-A Louisville, allowing four hits in what was expected to be his final rehab appearance. In six starts and one relief appearance, he’s 2-2 with a 4.78 ERA. Bailey has been on the disabled list since June 2 with right knee inflammation but is now expected to return to the Reds starting rotation. Tyler Mahle, Anthony DeSclafani and Matt Harvey are the first three scheduled starters after the All-Star break. The Reds have not announced their rotation for the three games that follow against the Saint Louis Cardinals.